A Jersey City community association wants to turn an abandoned rail cut into a 17-acre High Line-style park. 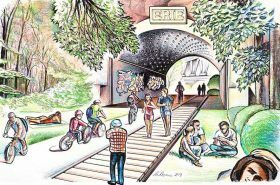 The Journal Square Community Association is proposing turning what used to be the Erie Railroad’s four-track cut through the Palisades into a public park. Better known as the Bergen Arches, the historic rail-cut borders Journal Square and opened in 1910, but has not been in use since the late 1950s. Since then, the Bergen Arches has become an overgrown wooded area in the expanding Journal Square neighborhood. A swath of new renderings of SCDA Architects’ condo tower was released this week, more than three years after the project was first announced in 2014. 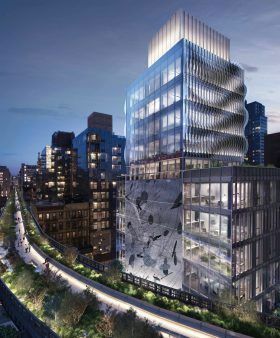 As Curbed NY learned, the new renderings of the building, located, at 515 West 29th Street, show a glass fin facade and the interiors of the 15 planned apartments, including five penthouses. Forum Absolute Capital Partners is developing the tower, dubbed Five One Five, which will contain two- and three-bedroom units ranging from $4.3 million to $8.5 million. CORE is handling sales and marketing. Carter Uncut brings New York City’s breaking development news under the critical eye of resident architecture critic Carter B. Horsley. This week Carter brings us the third installment of “Skyline Wars,” a series that examines the explosive and unprecedented supertall phenomenon that is transforming the city’s silhouette. 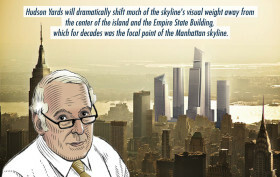 In this post Carter zooms in on Hudson Yards. The Hudson Yards neighborhood in Far Midtown West is one of the country’s most active construction areas. Construction cranes dot its emerging skyline and dozens more are promised now with the district’s improved connection to the rest of the city. Last fall, the 7-line subway station at Eleventh Avenue and 34th Street opened with one-stop access to Times Square. The newly-minted station features a lengthy diagonal escalator bringing commuters to the front-door of the huge mixed-use project being created over the rail yards west of Tenth Avenue between 30th and 33rd streets. Originally, a second station was contemplated on 41st Street and Tenth Avenue but transit officials claimed it could not afford the $500 million expenditure, despite the enormous amount of new residential construction occurring along the far West 42nd Street corridor. Nevertheless, the finished Hudson Yards station deposits straphangers into a new diagonal boulevard and park between 10th and 11th Avenues that will ultimately stretch from the Related Companies / Oxford Property Group’s Hudson Yards master plan northward to 42nd Street.